It's that time of year again! Time to start planning for your wedding and special event. 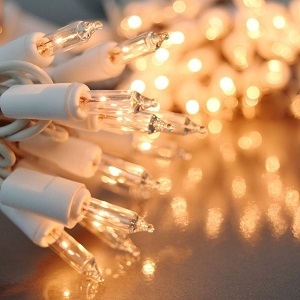 We have your White string lights in stock! Perfect for party and wedding decoration. Decorate your canopy tent, or string them up in the trees to give your event a one of a kind look! Available in either a 50 bulb count (12.5' total length, WHITE cord, White bulb) or a 100 bulb count (22.6' total length, GREEN cord, White bulb). Bring in this coupon or mention the ad from the website to recieve an additional 10% off on the lights. Supplies are limited to stock on hand, so stop by and get yours before we are sold out!